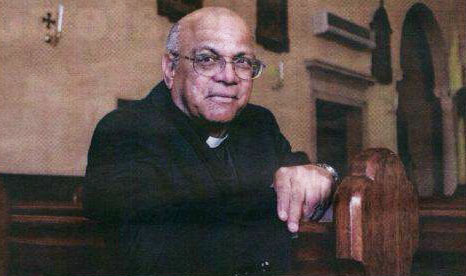 INTENSIVE RESEARCH: Father James Valladares, at St. Paul of the Cross Church. Picture by Matt Turner. (The Advertiser) An Adelaide priest has urged the Vatican to dramatically improve the way it handles sexual abuse claims, saying current procedures mean innocent priests are being victimized. Father James Valladares, who describe himself as a "survivors' advocate of sexual abuse," spent three months in the U.S. in his research into false accusations against the priesthood. While he acknowledged there were many legitmiate victims of sexual abuse by the priesthood, there was an equal number of claims made by those seeking financial gain, he said. In this book, Hope Springs Eternal in the Priestly Breast, Father Valladares examines the problem of false allegations and urges the church to adopt a set procedure that would protect accuser and accused until an investigation was complete. He found about half the accusations against priests were false, mostly because accusers were seeking money. "False allegations do occur and such allegations are devastating to the accused," he said. "Having said that, I do not wish to denigrate any of the harm that has been done - for that we are all very sincerely sorry. Our whole purpose now is to create a climate of trust and openness, transparency and acountability." Father Valladares said the pendulum had swung too far from the church protecting an accused priest to the church immediately acting on behalf of an accuser since 2002 when a huge cover-up of sexual offenses became publc. "I conducted this study to show that society is effectively tarring all priests with the same brush, using the allegations against a select few to discredit others," he said. He said a priest falsely acused of sexual abuse or molestation was ruined for life. "During my research, I found there are 1000 priests in America who are in limbo," he said. "They have been acccused, there is no substantive evidence, they have not been charged, but they have been removed from minstry with no hope of being reinstated. Father Valladares said a set procedure must be put in place so that the accused and accuser had their say and a proper investigation was conducted. Confidentiality was essential as once accusations went public it was the "beginning of the end," he said. "Procedure has to be faithfully followed to ensure justice to both the accuser and the accused. Just examine the case rationally and objectively and honestly." He said cases must be heard immediaely, with both sides having a say and a decision made. Whatever was said must be put down in writing, so nothing was left open to misinterpretation. Those found guilty must face grave consequences, including facing the law, but those found innocent would escape the blackening of their name.